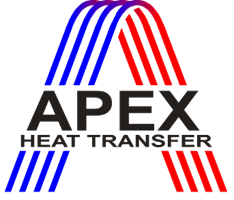 "We appreciate APEX Group’s design, engineering and fabrication expertise for delivering a heat exchanger able to meet the demanding operating [conditions]. Andritz would like to thank APEX team for their collaboration during the project execution. APEX was available and eager to tackle challenges presented to them and delivered good quality product, service and documentation." "In recognition of Euro-Apex’s compassionate Commitment on resulting the urgent request of reducing exhaust flue gas temperature in 2016. We deeply appreciate your efforts on in-time delivery, advanced products and precision site supervision." "The superior mechanical design engineering and production execution guaranteed successful operation of equipment withstanding very large Combustion Air flows at 2.5 barg pressure, bearing high seismic and external loads, all fitted into restricting site plot space. APEX Group provided excellent support thought the whole project. We are very satisfied with the installation, operation and the overall performance of the equipment." "The unit was put into service in October 2010, and passed performance test in January 2011. Temperature, pressure-drop and leakage all meet the design requirements. Now, it is still in good conditions." "Since being put into service from December 2006, the unit is running well. Temperature, pressure-drop and leakage all meet the design requirements." "It has been our experience on all these occasions to find that equipment and services offered by Benelux-Apex has met or exceed all requirements and expectation of the offers." "We deeply appreciate your efforts on in-time delivery, advanced products and precision site supervision. Formosa is able to not just meet the EPA regulation, but also benefits from high waste heat recovery." "We certify that we have in operation two air preheaters supplied by Benelux-Apex B.V. The units were installed in our Port Arthur refinery and have been in continuous operation to our full satisfaction since April 10, 1999." "Combustion air preheater used in 600KTA methanol plant was provided by Benelux-Apex B.V., the Netherlands. Since its installation and debugging in October 2008, the unit is running well till now. No corrosion occurs. Temperature, pressure drop and leakage all meet the design requirements." 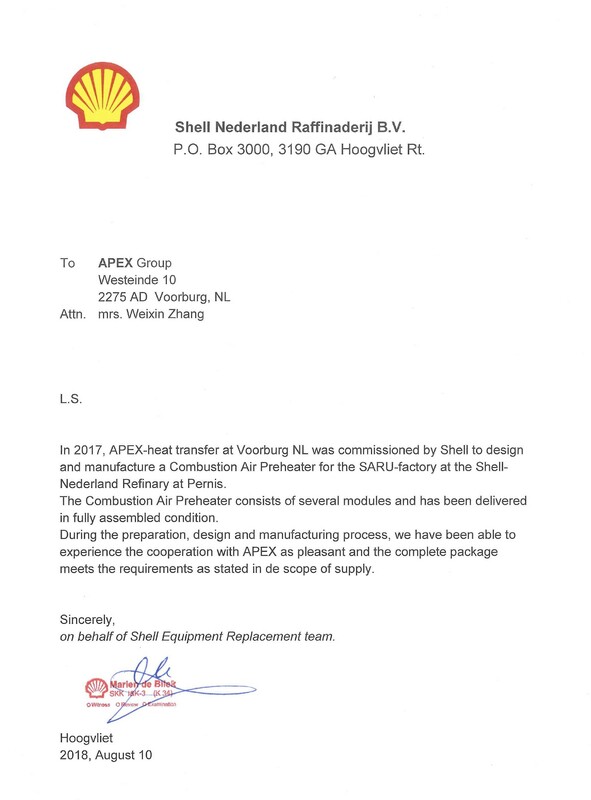 "I would like to acknowledge other aspects of this APEX purchase order also went quite smooth, including project execution, responsiveness to our drawing questions and comments, shop QA/QC, fabrication and transportation on the air pre-heater." "APEX were very proactive in offering advice and formed a core part of our team in planning the upgrade. (…) APEX visited our location during the shutdown itself to inspect the modules and help implement the improvements. (…) APEX were key in helping to define the solution required and suggesting the improvements to ensure deficiencies were permanently removed. I was very impressed with their professionalism and drive." "The unit has been in continuous operation since November 1994 to our full satisfaction."